The FT951 25mW FPV transmitter may only be small and weigh just 7grams, but it punches well above its weight. 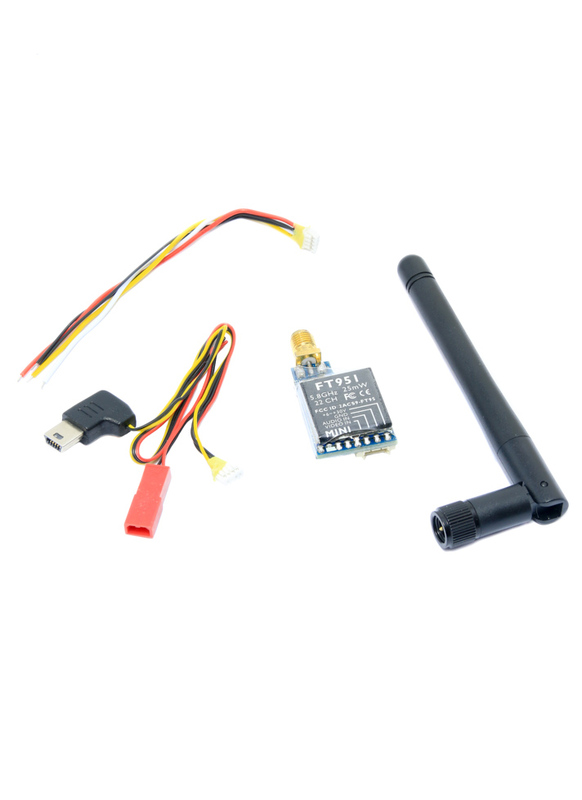 It has 22 available channels in the 5.8GHz band, making it compatible with most FPV gear on the market including Fatshark and ImmersionRC gear. Best still, it’s fully legal for licensee free operation in the EU and UK - it has a FCC and CE certification. Although you have probably seen more powerful FPV transmitters, don't think it has a poor range because of its low power rating. With the stock antenna you can get 200m in open space. However, if you use a combination of circular polarised and helical antennas, it’s possible to achieve a range of over 800m. The TX uses an SMA connector so it can use the full range of ImmersionRC/Fatshark antennas. Finally, its micro size and low weight makes it the perfect TX for small racing drones. The FT951 comes with 2 dBi dipole (Rubber Duck) antenna and even a GoPro compatible video cable for plug and play compatibility. You can power it straight from your flight battery without the need for a UBEC as it supports a wide input voltage (2-7S). Exactly what is the style of the power adapter on the Boscam FT951 5.8Ghz 25mW 22CH FPV Transmitter? I have a power distribution board that I will need to add a connector for on it, and I can't tell from the pictures exactly what kind of adapter it is.